Many people hear of these grains, but have no idea how to cook them or what to eat them with, so they opt for the traditional white rice or pasta. Sadly, the pasta typically consumed and white rice are both processed, so they are no longer considered whole grain. A whole grain is a grain that contains the grain kernel (i.e. white rice kernel), the endosperm (i.e. wheat germ) and the bran (i.e. oat bran). All of these parts as a whole provide more overall nutrients than processed grains and also contain fiber. In addition, every kind of whole grain contains a different amount of different nutrients, which is why it is recommended to eat a variety of whole grains every day. Some more easily found, but less commonly used grains are pearl barley, brown rice, and bulgur. I like eating a variety of grains to make sure I don’t get tired of eating the same thing over and over again, so I tend to keep all three of these on hand. Brown rice is found by the traditional white rice. The barley and bulgur tend to be found in the organic/natural section of the grocery store. I wasn’t quite sure what to make for dinner tonight, so I decided to make a herb-spiced, vegetable and grain pilaf. This would go well with an Italian marinated chicken breast or nice cut of tender steak. Add onions, barley, and rice; sauté for 5 minutes. Add seasoning and carefully add the water; bring to a boil. 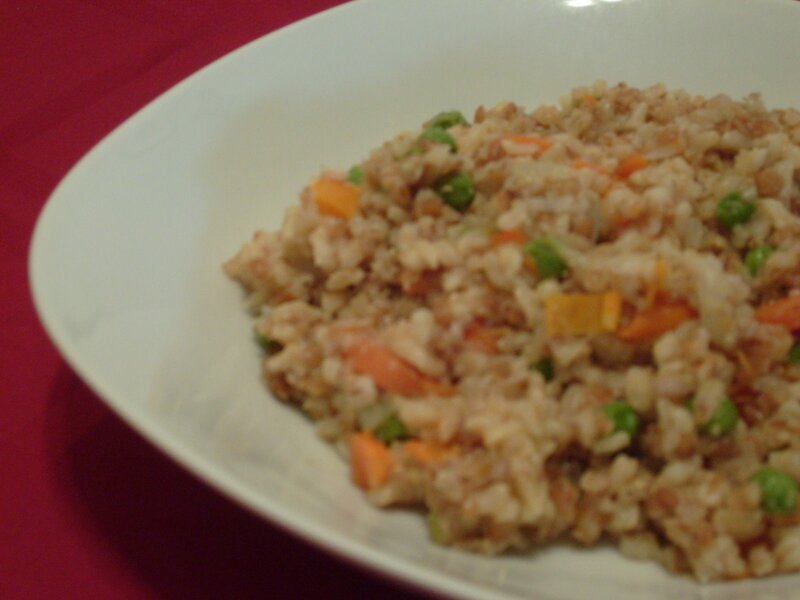 Once boiling, add bulgur and carrots. Reduce heat to medium-low, cover, and let simmer for 35 minutes. Remove lid and add peas and peppers. Stir until all of the water is absorbed. Serve with feta cheese crumbles or grated Parmesan cheese.